All good things must come to an end, but at least Game of Thrones is going to end with a mind blowing finale. That is, if Nathalie Emmanuel is to be believed. 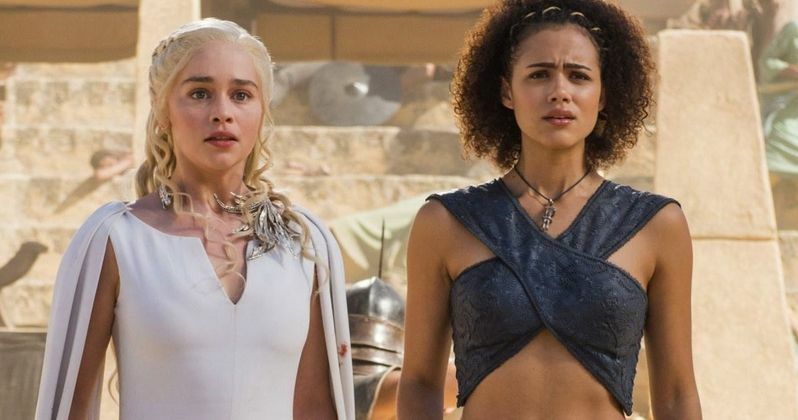 The actress, who portrays Missandei on HBO's hit fantasy series, recently discussed some of what we can expect from Game of Thrones season 8. In addition to a big finale, she promises the stakes will be increased and that there are a lot of storylines they will be busy tying up. Game of Thrones is taking 2018 off, which has left fans feeling quite eager to return to the world of Westeros. While the network is keeping the vast majority of what's coming our way next year under wraps, Nathalie Emmanuel teased a bit of what we can expect, in broad terms, during a recent interview. Here's what she had to say about it. "I think what we can expect from the final season of 'GoT' is just a real push. Like in the last couple of seasons, we have seen the pace of the show increase with the stakes getting higher and higher. There are so many storylines that have to come to conclusion. We have to play them out, so the pace of the show is continuing on that sense." Bringing the show to a satisfying conclusion is going to be a tough task. Not only because there are so many storylines to bring to an end, but because Game of Thrones season 8 will consist of just six episodes. Though, the episodes will be longer than usual and will almost serve as six short movies. The actress continued, promising that the finale will leave fans satisfied. "There are so many characters and stories that haven't found their conclusion. So, this season is going to be incredibly satisfying for people. It is going to be incredibly exciting and heartbreaking. I feel like people will have their mind blown when they watch the final one." HBO is going to be sad to see Game of Thrones go, there's no question about that. Sad as they may be, there is no way they are going to risk not sticking the landing. It's a tall order, but creators David Benioff and D.B. Weiss will surely have something thrilling up their sleeves for the finale. The network already has a spin-off in development, which will take place many years prior to the events of Game of Thrones. Assuming things go well, there likely won't be a terribly long break between the end of Game of Thrones and the debut of the prequel series. As for season 8? HBO has yet to announce an official premiere date, however, it was recently revealed that the final season will debut in the first half of 2019. At they aren't going to make us wait any longer than that to see this mind blowing finale. This news comes to us courtesy of the Hindustan Times.